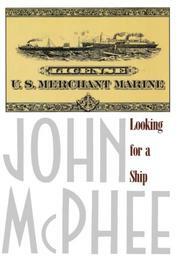 McPhee embarks on a cargo ship to South America, scouting the endangered life of the American Merchant Marine. The masterful essayist (most recently The Control of Nature, 1989, and Rising From the Plains, 1986) follows Andy Chase, second mate, onto the merchant ship Stella Lykes. Andy is among the oversupply of mostly aging sailors forced to spend too much time looking for a ship. From Charleston to Valparaiso, Cartagena, and Callao, these men sail, picking up and unloading cargo by the ton--here, including mattresses, methane, a fire engine, and starving horses. McPhee's sculptured prose sets us out on the water. The momentum of more than forty thousand tons, he writes, is as absolute as the darkness. Into the time-suspended pace of ship life--the meals, the watches--he intercuts geology, history, and navigation, letting 1835 Darwin evoke Chile today. At sea, tension abounds, not simply in the chance of storms (where walls of water can sever a ship), collisions, and pirates (who board the ship at Guayaquil), but in the ulcerated mst eating away the aging hull. Once No. 1 in the world in total ships, with over 2,000, the US Merchant Marine now has fewer than 400. Weighed down by taxes, insurance, and wages, American carriers can't compete with often-subsidized foreigners. (The Russians carry 50 times as much freight.) This loss we feel, watching the command of captain Paul McHenry Washburn, 65, who navigates by dead reckoning and docks a ship the length of Rockefeller Center as if he were closing a drawer. The romance of the Andes back-lighted from the water; the reality of stowaways, 150-degree engine-room heat, and a ship dead in the water--like the Merchant Marine itself: these McPhee captures. This classic sea story, previously published in The New Yorker, also asks why America responds in slow motion to global conditions.